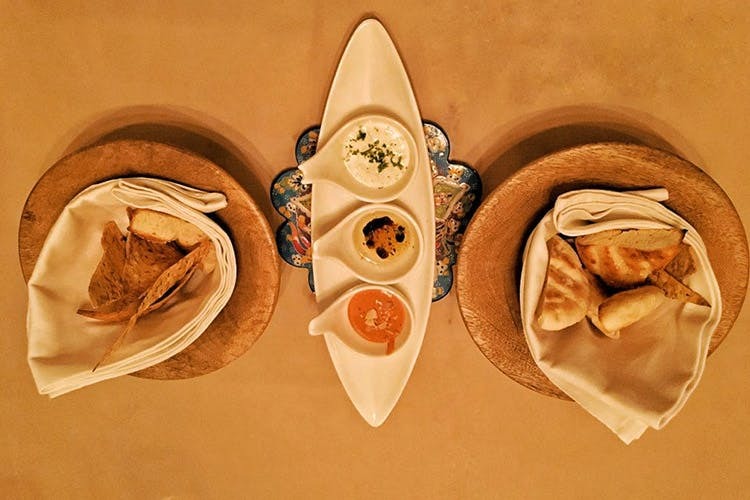 Baris in GK II promises Mediterranean cuisine, with Turkish and Lebanese flourishes. The food tastes as good as it looks. Tucked in a building that warrants a specific visit, Baris reveals itself slowly, but with great impact. A delightfully soothing theme of navy and cream under warm lighting, the Arabic motifs set the tone for what is to follow, and jazz music livens up the proceedings. The al fresco deck upstairs is made for candlelight dinners and laid-back sheesha nights. Ease yourself into exotic land with familiar Mezze- both the chilled and the hot variety. Baris does posh up Middle Eastern staples. We tried a brilliant pink Beetroot Labneh that had just a tease of garlic, and a creamy Labneh with Avocado speckled with cilantro. Both paired beautifully with crispy Lavash crostini, and almost made us a meal. The hot Mezze featured a stellar Shish Taook which had juicy chicken chunks and that distinctive tartness of sumac. What bowled everyone over though was the Mantar Yahsini- a delightful interpretation of the classic hummus which was baked for a subtle smoky effect, and served with sautéed wild mushrooms, onion, garlic and thyme. So good! Baris has an elaborate list of kebabs, which we decided to save for another visit. Instead we sunk our teeth into incredible mains- the Kuzu Incik which was tender tomato roasted lamb shank served over saffron rice, and my personal favourite for the evening- the Pilic Topkaki which was half a hen stuffed with rice, pine nuts and blackcurrants, baked to perfection and served atop a bed of creamy spinach. The vegetarian selection contained an intriguing special- The Biber Dolmasi starred delicately skinned peppers baked and served over a cheesy mornay. We ended our desert safari with the crisp and comforting Baklava that we fought to finish, and of course Turkish coffee that was clean and robust and came in the most darling of cups!